The 3 Ways to Improve Your Sales Technique: STOP. LOOK. LISTEN. Every customer is a unique lock, and you need the right key to open the door. Does your customer need information? To feel self-directed? To feel supported? When customer satisfaction is your top priority, whatever your customer is looking for is what you should try to provide. There are three simple strategies you can employ today for giving your customers exactly what they want, in exactly the way they want it: Stop. Look. Listen. When you’re talking to a customer, stop whatever you’re doing and give that person your full attention. Are you distracted? Do you have other people waiting for you? Is there something else you’d rather be doing? Maybe so, but it’s your job to never let a customer feel like there’s something else on your mind. You’d be surprised how easy it is to accidentally telegraph distraction to a customer. Are you holding your cell phone in plain view? Looking at someone else? Crossing your arms impatiently? Demonstrating bad posture? When you stop everything you’re doing, make eye contact, stay in the moment, and wait for the customer to take the lead, you give the customer the feeling that their business is wanted, and that you’re completely available to them, whatever they may need. Use visual cues to help determine what it is that a customer wants. Sometimes, it’s not what the customer says—It’s how they say it. You can read clues of how receptive a customer is to your approach by looking closely at their facial expressions. Are their arms crossed? Are they having a hard time making eye contact? Are the corners of their mouth turned down? Eyebrows furrowed? Those are sure-fire signs that your approach isn’t working, and you need to try a new strategy to make them feel more comfortable. Also, don’t forget to watch for telltale signs of the different DISC personality types. A D-style personality will make eye contact and won’t be afraid to stand close to you. They will get right to the point, and won’t waste any time. They are solution-driven, and will appreciate a no-nonsense approach that won’t take up too much of their time. An I-style personality can be identified by their kinetic energy—Look for expressive hand gestures and an open, conversational style. They will appreciate a personal approach, based on friendly, enjoyable communication. An S-style personality will be slow-paced and relaxed and more serious and reserved in the way they present themselves, and are interested in involving others in the decision-making process. They will seek out help, though quietly and unobtrusively. A C-style personality is outwardly introverted in they way they present themselves, keeping their distance and wanting to maintain personal space. They like to research, compare, and think, and may will come across as intellectual and inwardly-focused. How does the person move? A faster mover and big gesturer will likely be a D or an I-style. A slower mover will be an S or a C. What is the person’s posture like? Intense and alert posture signifies a D or an I. Relaxed posture signifies an S or a C.
When you pay attention to facial expressions and body language, it becomes easier to adopt the right approach. A D-style personality will prefer to be offered a fast and simple solution. An I wants to be liked, and to like you in return. An S wants to feel good about the sale, and a C wants to make logical and informed decisions. Don’t tell customers what they need. Just listen to what they want. At the beginning of every interaction with a customer, ask what you can do to help. Give control to the customer, allowing them to describe what they need, or what problem needs to be fixed. And when they talk, really listen. Don’t think about the next thing you want to say, don’t nod along and pretend to listen. Listen to what they need, but also listen to how they say it. Often, the way that a customer communicates their needs is just as important as what they say. For example, from observing patterns of speech, does the person seem determined and decisive? Are they able to articulate what’s needed in a quick and straightforward way? Are they focused on the overall vision, end result, or big picture? That person’s personality is likely a D-style, and they will want you to provide a simple, straightforward solution without walking through a variety of options. Does the customer approach the situation in a conversational way, including personal details and anecdotes from their day? That person is likely an I-style. Does the customer seem concerned with feelings, or what others think about the decision that needs to be made? You’re likely dealing with an S-style. Does the customer focus on specific information, such and price and functionality? Do they steer the conversation to exact details or processes? This person is likely a C-style. Take note, too, that fast talkers will likely be a D or an I-style personality. Slow talkers will likely be an S or a C-style. 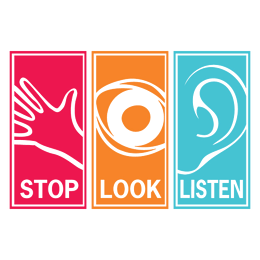 When you “Stop, Look, and Listen,” you ensure that you’re creating the best possible dynamic with your customer, one that will close the sale and leave that person feeling valued, respected, and heard. For more tips on how to explore the connection between sales and personality type, try our DISC Sales Style Report. If you’ve used any other strategies for identifying personality style through body language and conversational patterns, we’d love to hear about it. Share your ideas in the comments below.